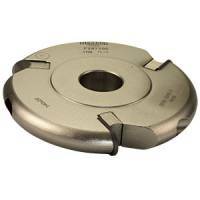 Two wing cutters in 1/2" shank size to produce traditional raised and fielded panels. They produce a maximum cut width of 30.5mm and, if used freehand, must be used either with a roller follower or guide fence, they can not be fitted with a bearing kit. MAXIMUM SPEED FOR THESE CUTTERS IS 15,000 rpm.